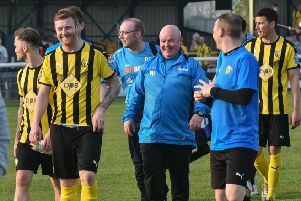 Brakes’ exit strategy showed little sign of change as they bowed out of the FA Trophy as they did the FA Cup, at the first hurdle, writes Paul Okey. A first-half goal from Zeph Thomas meant another potential boost to their economy has been missed and manager Paul Holleran said his side only rarely looked like wanting to remain in the competition. “We didn’t really come close to the levels we needed to all afternoon really, only in fits and starts,” said Holleran. “We’ve allowed them to score what was from our perspective a poor goal - it was something we should have dealt with. “But we’ve gone on to have enough chances but our quality in and around the box hasn’t been where it has needed to be for the last couple of games. “As I’ve said to the players, both of the big competitions you enter into, we fell at the first hurdle and performances haven’t been at the levels they need to be. “I certainly wasn’t too happy with our application in certain periods as well. Mickleover right-back Jake Bennett gave early notice of his threat when he overlapped to send in a cross which was cleared. However, it was the home side who had the better of the early skirmishes, with a tame Jack Edwards header fumbled by Jake Eastwood who then saw a fierce shot from the midfielder fly past the angle. An injection of pace from Ahmed Obeng then allowed Connor Gudger to send in a cross which flew across the face of the goal. Bennett, who had been highlighted as the visitors’ danger man by Holleran, got to the byeline in the 18th minute and had time to pick out a cross to the near post which Brodie Litchfield was inches away from converting. And two minutes later Bennett provided the assist as Mickleover went in front, driving into the box and feeding Thomas who turned smartly and drilled the ball into the far corner with Breeden motionless. Baker-Richardson put in a tame header as Brakes tried to respond and then headed over after Obeng had drawn a foul from John McGrath which earned the Sports player-manager a booking. Brakes did have the ball in the net in the 37th minute, with Edwards’ header-on from Breeden’s free-kick eluding Eastwood’s kick as he was challenged by Ryan Rowe. However, the assistant referee had his flag raised as soon as Rowe became active. Brakes were working up a head of steam and Edwards’ sidefoot effort was straight at Eastwood, while Baker-Richardson’s snapshot whistled just past the post with the visitors’ keeper beaten. Rob Thompson-Brown was denied by a brave block from Jack Broadhead as the goal looked to have opened up, with the defender needing lengthy treatment for his troubles. Eastwood then smuggled the ball unconvincingly past the far post after Baker-Richardson had benefited from a fortuitous first touch to get a shot away from the edge of the box. As the half drew to a close, Bennett intercepted on half-way and advanced on the Leamington goal. The counter was ended unfairly but Andy Dales could only curl the subsequent free-kick into the midriff of Breeden. Thomas had the first sign of goal after the restart, working space only to fire straight at Breeden. The home side then had the ball in the net for a second time, with Rowe again the subject of the flag before his header back across goal was converted at the far post by Obeng. Brakes were awarded a free-kick in a promising position after Edwards was bundled over on the edge of the box but Richard Taundry could only direct his effort into the arms of Eastwood. Litchfield diverted a Danny Schofield corner just over the bar from close range in a rare spell of Mickleover pressure before Thompson-Brown took over free-kick duties on the edge of the box for Brakes. This time, the shot took a huge deflection off the wall and Eastwood, who was already committed, was able to thrust out a strong right arm and somehow divert the ball away from goal. It was a superb stop totally out of keeping with his timid first-half showing, but the keeper was powerless in the 63rd minute when Baker-Richardson advanced unmarked on to Rowe’s cross to the far post. However, with the goal gaping, Baker-Richardson rattled the post and the ball rebounded to safety. Baker-Richardson then looked favourite to convert a cross from Obeng at the far post but the ball was nicked away from him for a corner. Callum Gittings and Nathan Olukanmi were introduced to try and pep up the home side, who were again denied by Eastwood, with the keeper producing a superb tip-over from Edwards’ downward header. Taundry beat two men in the box only to see his eventual shot blocked and Edwards headed straight at Eastwood before trying to recreate his Cinderford heroics with an ambitious effort which was comfortable pouched by the overworked netminder. It was a long shot in every sense of the word and the final whistle arrived with leavers holding a slight majority over the remainers and Holleran again needing to pick up the pieces after another soft Brexit. Brakes: Tony Breeden, Richard Taundry, Connor Gudger, Darren Pond, Jamie Hood, James Mace (Tom James, 86), Courtney Baker-Richardson, Jack Edwards, Ryan Rowe (Nathan Olukanmi, 71), Rob Thompson-Brown (Callum Gittings, 73). Subs not used: Joe Magunda, Ben George. Mickleover Sports: Jake Eastwood, Jake Bennett, Ben Turner, John McGrath, Tom Burgin, Jack Broadhead, Andy Dales, Lewis Belgrave, Zeph Thomas (Adam Baskerville 72), Brodie Litchfield, Danny Schofield. Subs not used: Albert Lansdowne, William Norcross, Elliot Ptak, Clinton Morrison.